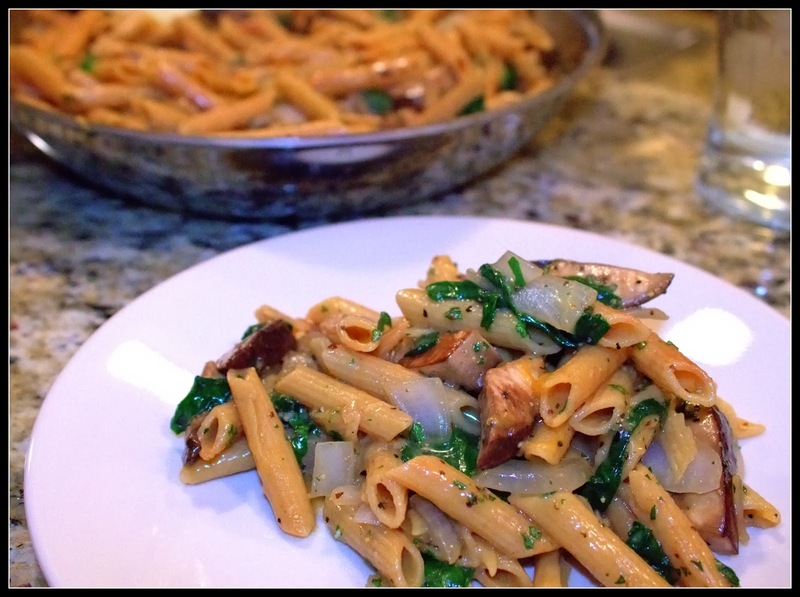 A decedent pasta you can enjoy guilt free? Sign me up for that! This delicious pasta contains no heavy cream, cups of olive oil or butter! Are you wondering how this pasta can be so creamy then? Well, the pasta gets its creaminess the same way a risotto does, it is all based on how the pasta is cooked. I discovered this new pasta cooking technique in the newest Cooking Light magazine. You start by sauteing uncooked pasta in hot olive oil. This first step is very important as it initiates a process called the Maillard reaction. 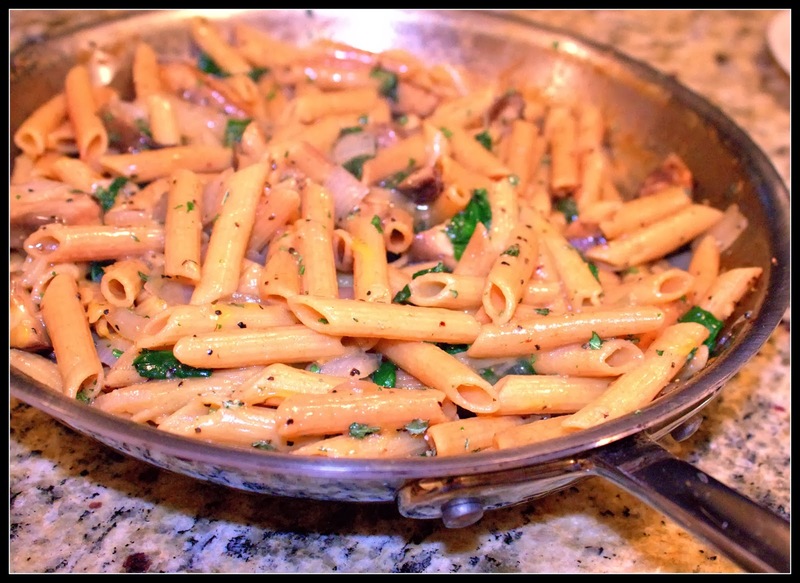 Apparently (I learned this from Cooking Light), the Maillard reaction is what makes foods taste "toasted," and this Maillard reaction helps give this pasta its creamy texture! You see, once you have toasted your pasta you slowly add in chicken/vegetable stock to cook your pasta verses throwing the pasta in a large pot of boiling water to cook! By cooking your pasta slowly with stock you allow the toasted starches (which is created by the maillard recation) to "slough off" in the simmering stock, thus creating a creamy rich pasta sauce! See, no cream, butter or olive oil needed! I added meatiness and texture to this meatless dish by sautéing up thick cut portobello mushrooms. 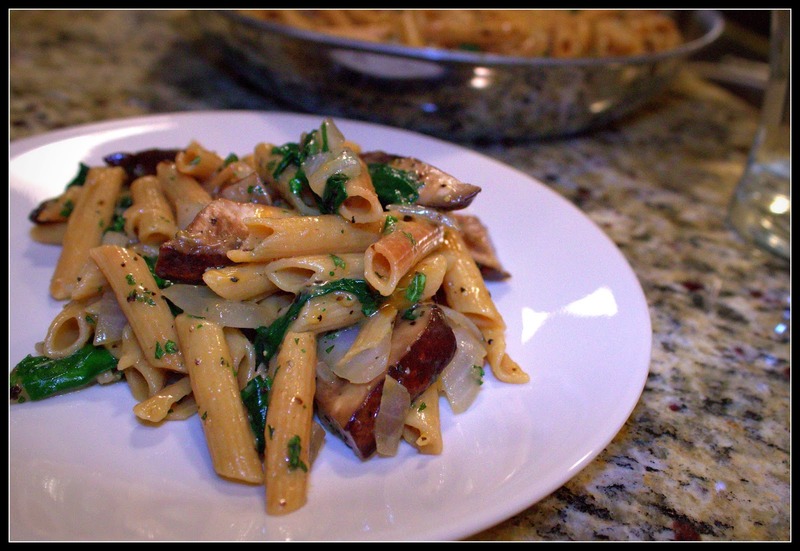 The mushrooms really added great texture and bulk to the pasta. 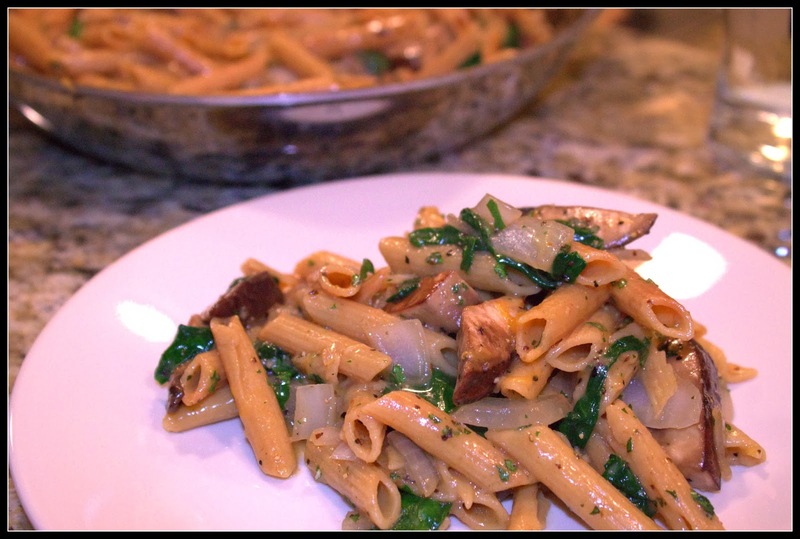 The onions and shallots provided wonderful flavor, and the dish received a bright pop of color from a handful of spinach that I added in with the pasta during the final cooking stage! A touch of parmesan cheese and some fresh basil completed the meal! Serve with crusty bread to soak up the delicious creamy sauce! 1- Bring stock to a simmer in sauce pan and keep warm. 2- Heat 1 tablespoon of olive oil in a large skillet. Add dry pasta and cook 5 minutes or until pasta is toasted. Stir Frequently. Once toasted remove pasta from pan and set aside. 3- Add remaining 1 tablespoon olive oil to skillet. Add onion and shallots cook until translucent. Add portobello mushrooms and cook until tender, 5-6 minutes. Once mushrooms are done remove onion/mushroom mixture from pan and set aside. 4- Add pasta back into your sauce pan along with 1 cup of your heated stock, turn heat to medium. Cook until stock is completely absorbed by the pasta. Remember to stir constantly. Continue this process until stock is gone. 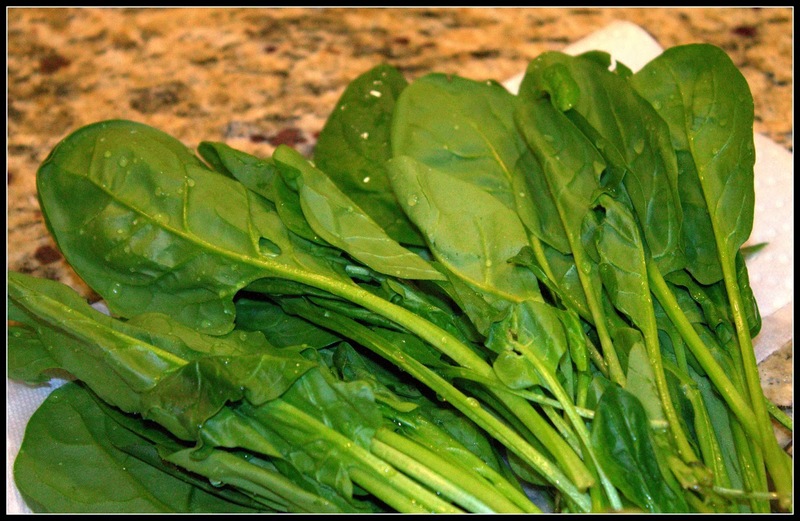 **Note when last cup of stock is almost absorbed add in your spinach and cook until wilted. 6- Garnish with basil and additional cheese if desired.